On Monday, March 9, 2015, Dr. Alexander Batthyány gave the following keynote address to the First International Congress of Viktor Frankl’s Logotherapy in Israel, held in Haifa. With his usual grace, Dr. Batthyány has given his kind permission for us to share the address with you. Alexander Batthyány is President of the Viktor Frankl Institute Vienna and Director of the Viktor Frankl Archives. He is Professor and Academic Director of the Viktor Frankl Chair for Philosophy and Psychology at the University of the International Academy of Philosophy in the Principality of Liechtenstein. This chair was established by Dr. Viktor Frankl himself and represents the world’s first and only Ph.D. program in logotherapy and logotherapy-related interdisciplinary studies at a fully accredited institution of higher learning. Dr. Batthyány is also Professor of Psychiatry at the University of Vienna, Vienna Medical School. He is widely published in the areas of the philosophy of science, logotherapy, and consciousness studies with over 50 citations to his credit. 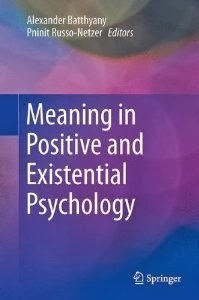 These include five monographs, six edited anthologies, and ten edited volumes the most recent being Meaning in Existential and Positive Psychology, edited with Pninit Russo-Netzer. Forthcoming works include Conscious Selves: An Argument for Brain‐Mind‐Interactionism; To Cope, To Strive, To Understand: Existential Questions in Psychology. He is Head of the Editorial Board and First Editor of the 14‐Volumes of The Collected Works of Viktor Frankl, of which the first five volumes have been published. The complete set is expected to be finished around the year 2020.